You might like this game if you like slow paced action games. zSubHunt is a very simple action game. 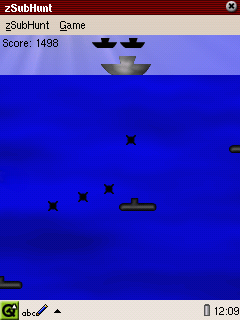 Submarines pass underneath a ship and you have to drop depth charges to destroy them. The amount of bombs dropping at the same time is limited and each bomb dropped costs points. On the other hand you gain points for hitting a submarine. 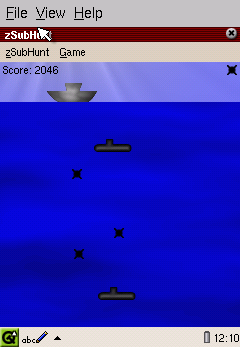 Each submarine leaving the screen will cost a life until the game is lost. zSubHunt is a simple game indeed. Unfortunately there is not much to do and not many options available. You drop the bombs and hope for the best. The most interesting part is that it is quite hard to hit the submarines at the beginning as the charges drop very slow compared to the speed of the submarines. However, once you got the idea when to drop a charge this gets easier. As also the graphics is quite simple you need to be a big fan of such type of games to keep playing it.